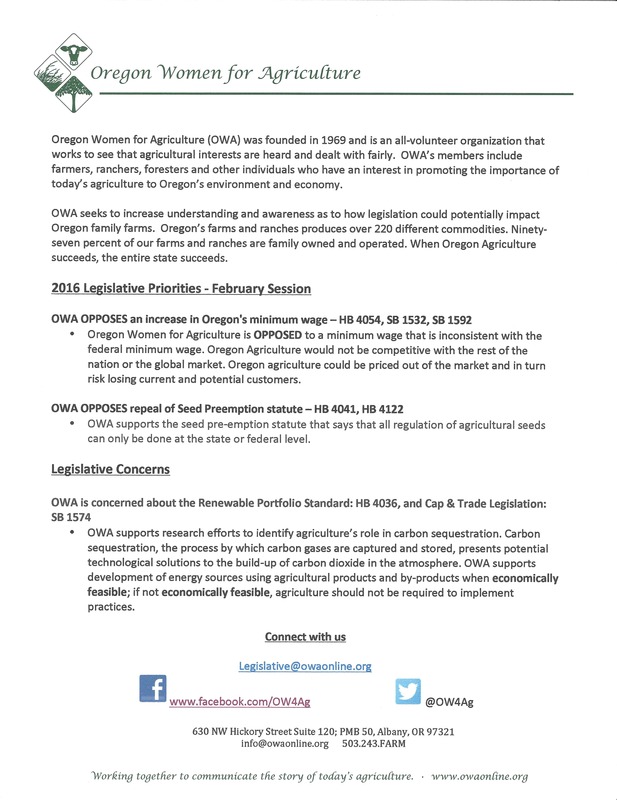 Oregon Women for Agriculture has identified the key legislative priorities and areas of concern for the 2016 February Legislative session. There has been over 600 bills filed for the 35 day session. It is vital that we have as many members possible participating and paying attention to what is going on in Salem. On Thursday February 4th, OWA members will visit the Capitol to meet with their legislators. We encourage all members to attend. Please RSVP to Marie Bowers so that we are as prepared as possible. Also please make appointments with your legislators, if you need assistance contact anyone on the legislative committee. Oregon Women for Agriculture is OPPOSED to a minimum wage that is inconsistent with the federal minimum wage. Oregon Agriculture would not be competitive with the rest of the nation or the global market. Oregon agriculture could be priced out of the market and in turn risk losing current and potential customers. OWA supports the seed pre-emption statute that says that all regulation of agricultural seeds can only be done at the state or federal level. OWA supports research efforts to identify agriculture’s role in carbon sequestration. Carbon sequestration, the process by which carbon gases are captured and stored, presents potential technological solutions to the build-up of carbon dioxide in the atmosphere. OWA supports development of energy sources using agricultural products and by-products when economically feasible; if noteconomically feasible, agriculture should not be required to implement practices.